Nanotechnology has had a multitude of applications: from healthcare to textiles to new consumer gadgets, innovative new uses for nanotechnology are constantly emerging. It has now found a new role, with University of Alberta-based nanotechnology accelerator Ingenuity Lab using it as the basis for the development of a revolutionary new way to clean up oil spills. The system has received a vote of confidence from Natural Resources Canada, with the organization providing $1.7m to fund its ongoing development. 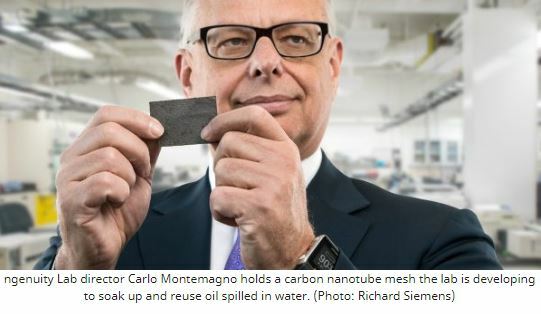 Using a carbon-nanotube mesh combined with other minerals and polymers, Ingenuity Lab’s system acts as a sponge that attracts and absorbs oil underwater. When it is fully saturated with oil, the mesh is then removed from the water and exposed to heat, electricity or ultraviolet light, causing it to expel the collected oil. Past tests have shown the system can be remarkably effective and is capable of cleaning up 100 percent of a spill – even the heavier oil that may be trapped below the surface. The system also recovers the oil, allowing it to be reused and potentially recuperate some of the cost associated with cleaning up a spill. The technology is far more advanced than current methods of containing a spill, which usually involve floating booms and skimming oil from the water’s surface. Ingenuity Lab’s system would make a substantial difference should the world see another event on the scale of the 2010 Deepwater Horizon disaster, or the Exxon Valdez spill of 1989.